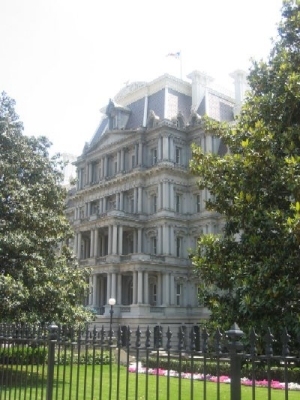 On the other side of Pennsylvania Avenue, across from the Renwick and Blair House, is the Old Executive Office Building, which was completed in 1888 after 17 years of construction. It houses White House staff. Calling it "ornate" doesn't begin to describe it. When the humorist and novelist Mark Twain tried to describe it, he came up with: "the ugliest building in America." President Harry Truman agreed. He called it a "monstrosity." Part of it is open for tours, but not on a Saturday. The Old Executive Office Building was renamed the Dwight D. Eisenhower Executive Office Building. President Bill Clinton approved legislation changing the name on November 9, 1999. President George W. Bush participated in a rededication ceremony on May 7, 2002.